With the largest market share in the industry, Asahi Super Dry is loved by people of all ages across the globe. We here at jStyle will be sharing an otsumami recipe today to introduce you to the Japanese izakaya culture and enhance your beer drinking experience. The Japanese brewing company, Asahi Beer, marched to the top of the industry with their leading product – Asahi Super Dry, reigning over the market for 8 consecutive years since 2010. Asahi Super Dry made its debut in 1987 as Japan’s first ever dry beer. After rigorous market research, development began to realise the dream of creating, “a beer for the people”. The final product captured the needs of the market and became a huge success immediately after its release. 10 years later, Asahi Beer snatched the crown to acquire the largest annual share of beer. Over the past 20 years, it has become a beer synonymous with Japan. It also proudly boasts impressive sales figures outside of Japan thanks to its crisp flavour, refreshing drinkability, and praise as a beer that complements everything. 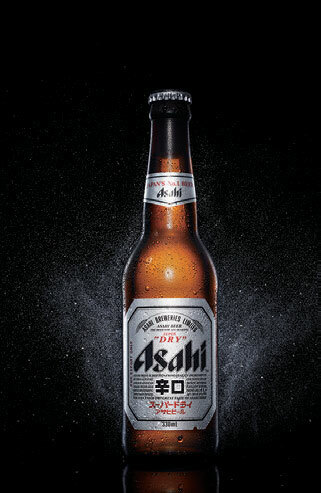 Asahi Super Dry hit Australian shores in　1992 and continues to raise its stocks in the premium beer market. Australia is ranked between 20th~30th in world beer consumption, with the average amount consumed per person double that of Japan. The recent　trend in Oceania has seen an expansion of the international premium beer market. Asahi Super Dry is limitlessly drinkable and complements any dish it happens to find itself next to. It happily accompanies a wide range of cuisines, including Japanese, Western-styled, and Chinese dishes with a first swig that just can’t be beat. Many tourists flock to Japan for a foodfilled holiday. While sushi, ramen, and other Japanese cuisines are popular choices, there is another well-loved establishment amongst gourmands – izakayas. Izakayas are different to restaurants with their variety of different alcoholic beverages and simple dishes to suit them – almost akin to a Japanese pub. Unlike your average pub, the Japanese counterpart has more of a focus on enjoying the food, and not just the drinks. The most common way of enjoying an izakaya experience is to order lots of different dishes to share　with a large group of people. It is customary in Japan to order a beer before getting started at an izakaya. While drinking something high in alcohol on an empty stomach can bring unneeded stress to the body and lead to hastened　intoxication, a glass of Japanese beer is the perfect way to start an izakaya trip due to its low alcohol content of 4 to 5%. Beer is also said to increase one’s appetite due to the stimulatory effects that the carbonation and bitterness of the hops has on the stomach. It is also the best thing to order when gathering a large group of people in for a toast since all of the beers come out almost instantly. Downing a glass of beer before settling in for a delicious meal is just one of the many facets of the Japanese izakaya culture. An essential element at an izakaya is “otsumami” – food to bring out the flavour of one’s drink. Otsumami is also known a “sakana” (side dish). The origins of the word　sakana come from a combination of twocharacters which literally mean “side dishes　for alcohol”. Differences in food culture arequite clear when comparing the different drinking snacks on offer in various countries. In Australia and the UK, chips and peanuts　are common fare, whereas tapas can be found　in Spain. In the case of Japan, the selection　of otsumami menu items are vast with a wide　range of ingredients used. Kenji Maenaka, the owner and head chef　of Izakaya Fujiyama in Surry Hills is a chef　offering classic Japanese izakaya dishes to suit　Australian palates. 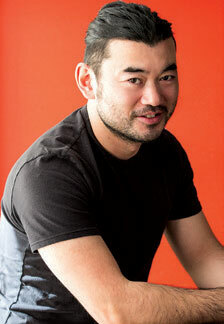 Keep　reading to find a recipe　by chef Maenaka for an　otsumami recipe easy to replicate at home. From Hokkaido. A chef with 23 years of experience. Learned the basics of Japanese cuisine from his sushi chef father. Arrived in Australia in 2003 and worked as a chef in popular Sydney restaurants such as Porteno and Bodega. Opened Izakaya Fujiyama in Surry Hills, Sydney, in 2011. Has been awarded a one hat rating from the Sydney Morning Herald Good Food Guide for 4 years running since 2014. Sweet and spicy chicken wings is one of the mainstays of izakaya menus. The crispy skin and plump, juicy chicken meat makes for an addictive dish. While some methods call for tossing the wings in the sauce after deep frying them, this recipe uses a frying pan to caramelise the chicken before finishing it off with a special sauce. 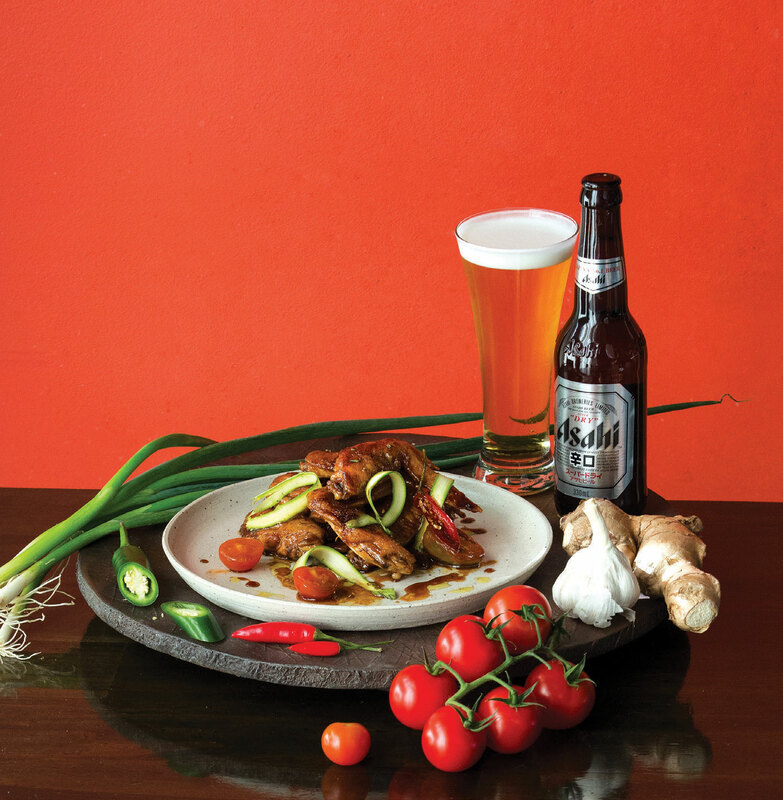 Make sure to season the chicken well to create a dish that keeps the beer flowing. 1. Fry the wings in a well-heated frying pan with some oil. Flip the wings when they become golden brown and place them onto a plate together with the oil. 2. Add the tamari soy sauce, sugar, sake, and mirin to the same pan and bring to the boil on high heat. When the sauce comes to a boil, add the garlic (gently crushed by hand with the skin on), spring onion stick, chilli, and chopped ginger to the sauce. 3. Return the wings to the pan with the sauce, place them caramelised side up, and add a little more mirin. Stew the wings in the sauce, basting regularly with a ladle. 4. Sprinkle black pepper on the wings and simmer for a little longer. 5. Serve with flash-fried tomatoes and sliced asparagus (or vegetables of choice), and pour the sauce all over the wings. Only fry one side of the wings Baste the wings continuously in the frying pan whilst stewing them.